FLORENCE, S.C. -- A 30-year police veteran was killed and six of his comrades wounded when a man opened fire from inside his home on deputies who came to serve a search warrant, authorities said. The shooting continued for hours as the man barricaded himself inside with children, firing from a distance at officers who came to help. CBS News correspondent David Begnaud reports that Florence Police Chief Allen Heidler was unable to fight back tears describing Carraway. Heidler called him and the rest of the wounded officers "family." "I want you to pray for the family who lost the bravest police officer I have ever known," Heidler said. 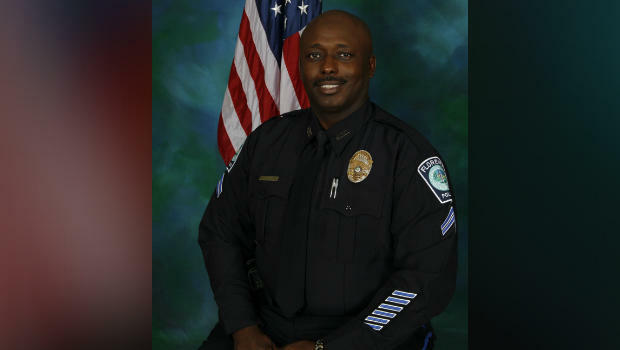 Terrence Carraway Florence, South Carolina, Police Dept. Authorities had to use a bullet-proof vehicle Wednesday to recover the wounded, and the shooter finally released the children as he was taken into custody, authorities said. "Officers went there unknowing the firepower the suspect had," Florence County Sheriff Kenney Boone said at a news conference. "Fire was being shot all over. The way this suspect was positioned, his view of fire was several hundred yards. So he had an advantage. The officers couldn't get to the ones who were down." The violence stunned people already dealing with record flooding from Hurricane Florence. Both the sheriff and police chief both cried as they spoke to reporters after the standoff. CBS affiliate WBTW-TV, citing Chief Deputy Glenn Kirby, reports that a 20-year-old male inside the home was also shot and is still alive. "Thanks to our MRAP, armored personnel carrier, we made sure all the officers that were shot were protected and brought for medical atttention," he said. President Trump tweeted his "thoughts and prayers," saying "We are forever grateful for what our Law Enforcement Officers do 24/7/365." Boone said investigators from Richland County would help. He did not say why he wasn't using state police like most law enforcement agencies do in officer shootings in South Carolina.